the scent of green bananas: ah the heartiness of chard-iness. Posted by santos. This entry was posted on 20060504 at 2:59 PM You can skip to the end and leave a response. Hey Santos, Sorry to have been away so long, I've been checking in but the move has made me too lazy to post... I love chard, too. Gratin is a great, if caloric, way to cook them, but I love it just stir-fried with garlic, too. So what's this change of scenery you're getting? I got mine already! 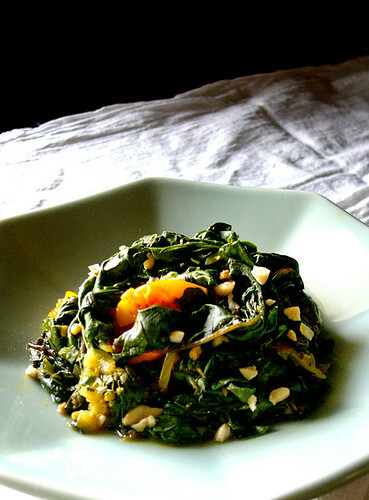 Chard sauteed with some pine nuts and dried cranberries in olive oil and garlic is the best. Add the cranberries into the oil before you add the chard. The cranberris plump up quite nicely The sweetness nicely balances the chardiness. Clicking around your site -- you have a career in food photography if you want it, Santos! The photos are really beautiful. The picture of the red stemmed chard is gorgeous. I'm trying to find chard recipes these days (have a friend who grows chard and gifts us) and your recipe with the Indian spices sounds great, as does TG and angrygrad's methods of cooking it. 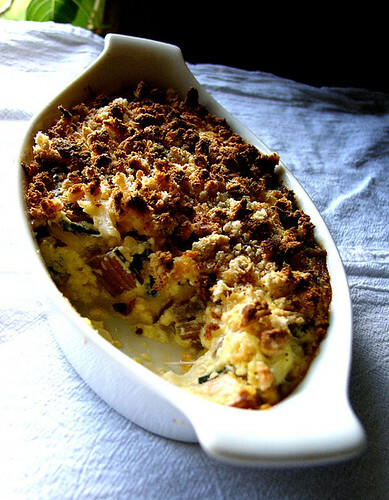 That gratin looks fantastic- I'll have to try it that way, probably as a main dish. BTW, I love the new look- very clean and fresh. Never seen it in red, so thanks for pointing this out because if I did find it, it would have probably ended up was a particularly disagreeable swiss chard and apple crumble. Wedo get the white stemmed silverbeet and the leaves ended up in a duck curry last night as an alternative to the less confronting cabbage. Shame to waste the stems though. ok, scent of green bananas but you've got a picture of green mangoes. he, he, that's funny. and i just noticed it. anyway, i've never tasted chard. is it bittery like collard greens? I haven't tried chard as yet - though i keep seeing them in the supermarket. Stares at it for a couple of minutes then walk away. I just didn't know what to do with them - how they'd taste, etc. I thought i need a change of scenery [i often find myself in the kitchen department of a store getting excited at a sight of different shapes plates, shiny pots and pans, etc]. Maybe one day i'll have enough courage to pick up a bunch of chard, walk straight to the counter [not leaving a moment to change my mind] and just cook it! Hey Santos, wonderful pictures. I love the color contrast and the lovely mood you've captured in these. I could see these in a Nigel Slater book. The food, of course, also sounds fab! It's the *image* of green mangoes but it's still the *scent* of green bananas, try scratching the screen - it works! hmmm... what the heck is chard in filipino??? No. Modesty and a sense of taste forbid it. Enough to say the punchline is "and go to McDonald for a Big Mac instead"
it looks so lovely and delicious. And also the thing is that it is a healthy food. Can you believe I've never tried it before? And I've even eaten seal. Geez. halllooo all! wowow, i never expected so many comments on chard. surprising veggie, that. thanks for the recipes, they sound great. i don't know what chard is called in filipino (can you find it there? ), and i don't think i've ever knowingly tried penguin or seal. but please, don't send recipes. 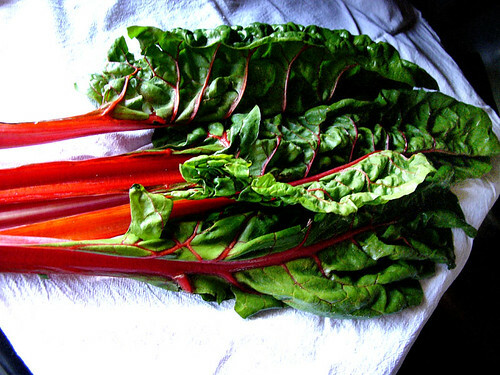 and yes, chard looks like rhubarb. i think all in all i'd much rather have rhubarb to experiment with. Anyway, my parents lived a long time in Spain, where they use a lot of chard, and they have this totally wonderful recipe: "tarta de bladas" (prolly got the spelling all wrong!). It's really quite simple, and so delicious. Just make a thin-crust pizza dough, bake it out and cover it with blanched chards (stem and all), sliced tomatoes (optional), chopped garlic, drizzle some olive oil over it and salt and pepper to taste. Cook in oven as you'd do with an ordinary pizza. Might not sound all that good, but it is, trust me! "Silverbeet" (whitestalk) they call it Down Here, is the usual spinach and until only recently much easier to find (in greengrocers and restaurants) than English spinach, or plain old "spinach" as I always new it before. It works a treat to use stalk and leaf in spinach & ricotta (cannelloni, puff pastry, raviolli, etc.). BabyBat made a mean palak paneer using the whole thing, too. Now the scoop: Mrs and I will be living back on Guam by July! gitto, that tarta sounds super-delicious! i am definitely trying that. guambat, hopefully there will still be chard on the shelves to remind you of Down There. whooo! more blogger on guam, hoorah! Perfect! We planted swiss chard in our garden this year, and they are just ready for pickin'. We'll be trying your take real soon. jmom, you wouldn't happen to know if there's a tagalog name of chard, would you? just wondering if it's grown there. I am guessing that enterprising Filipinos grow chard in the Philippines too, especially in Baguio where the weather is cooler. I'll have to check on this to verify. Sorry, I don't know what it would be called, but I'll investigate that too. BTW, I tried a variation of your recipe last night, with a couple of changes one being use of pinenuts instead of peanuts. It's a hit! I'll post it on the blog soon.